IP Content delivery and reporting engine for your full-length episodes, feature film screeners, sell sheets, and marketing collateral, such as on-air spots, music cue sheets, and more. Inventory your entire IP library by title and episodic programming, with the ability to include synopsis, running time, etc. 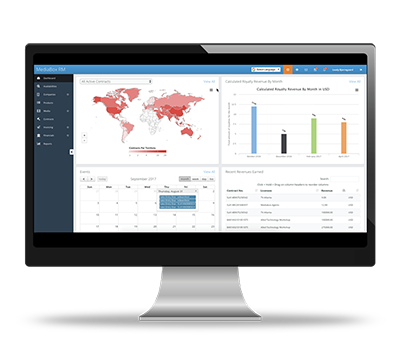 Track all IP rights (owned or licensed) in real time, with automatic detection of exclusivity conflicts based on available rights and existing licensing deals. Track physical or digital fulfillment orders by agreement, including title, materials, delivery dates, method, tape/file deliveries and all support delivery requirements. Comprehensive capture of financial transactions; Automated processing of invoices, revenues, and royalties. Multiple payment types, e.g. milestones, advances, minimum guarantees, etc. Multi-dimensional hierarchies allow flexible management of all your sold and unsold rights across Title, Language, Channel and Territory, with the ability to track exclusivity, holdbacks, blackouts, expiration dates, etc. Manage the full contract life cycle, automate your workflow and track your intellectual property rights, with the ability to store documentation files in any format. Manage all Buyer accounts in one location, showing contact information for each company and its Users, and add notes to track Buyer activity and record follow-up history. Built on modern web- and mobile-friendly software platforms, Mediabox-RM for Rights Management delivers robust, next generation functionality to the TV and Film Distribution industry, including Availabilities, Deal Memos, Contract Management, Fulfillment and Collections. 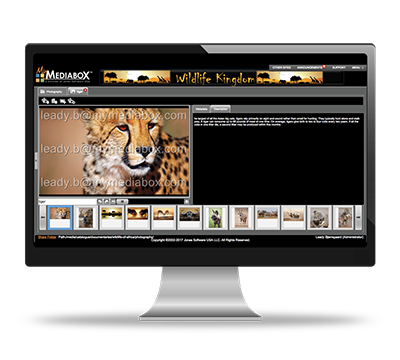 Integration with Mediabox-PA allows automatic import of product information, etc. Mediabox-DAM lets TV and Film Sellers create a personalized “Screening Room” experience for each potential buyer with a highly-branded, configurable user interface to showcase and preview selected titles on screen. Organize, manage and deliver full-length episodes and feature film screeners, sell sheets and other marketing collateral during the sales process directly to the buyer’s desktop or mobile device, in real time. Once a sale is made, Sellers can instantly deliver high-resolution marketing, publicity and fulfillment materials directly to the buyer, including cast photos, key art, promos, logos, scripts, cue sheets and more.